Near the North Pole, examining a submarine. When we were getting ready to go to Antarctica, people warned us about polar bears. Polar bears, they pointed out, are fast, big, smart, dangerous. They are more inclined than other bears to view humans as fabulous taste explosions. No, we said. We're going to the Antarctic, not the Arctic. There are no polar bears in Antarctica. Oh yeah. Well, polar bears eat people! During our stay, groups from our station occasionally visited passing cruise ships. The station manager and lab manager gave talks about the U.S. Antarctic Program. Then, Q & A for all of us from the station. They told you that was a bear costume? The ship passengers knew they would not be seeing polar bears. But some asked why. Ice and snow everywhere – perfect polar bear country. Why no big white bears? Here are my responses – after looking it up – to the Big Questions. Are there polar bears in Antarctica? Here's a way you might guess this from personal experience. Have you ever seen a photograph of a polar bear eating a penguin? Probably not. 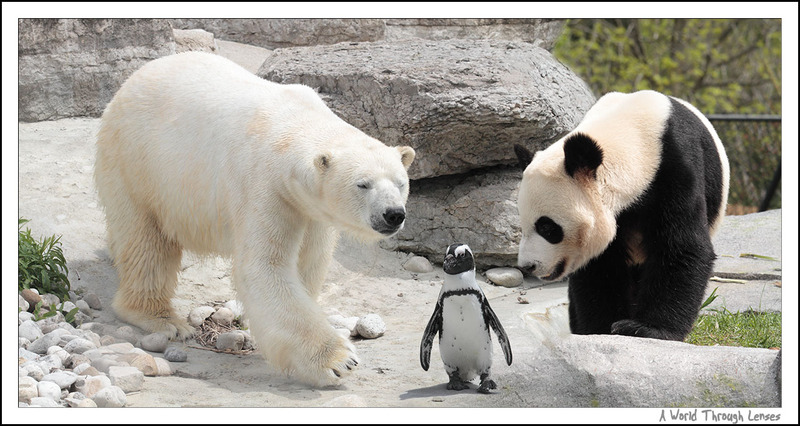 But if polar bears and penguins lived in the same place, there'd be photos. So far, no one's told me they've seen such a photo. Although there are zoos in this world, so who knows. Why aren't there polar bears in Antarctica? History! Really ancient history. There's a nice video by Sally Gillies that tells just how ancient. Basically, the bear family evolved in the northern hemisphere. As bears developed exciting new spin-offs (panda! sun bear! sloth bear! ), some bears moved south. To this day, there are more bear species in the northern hemisphere than the south. The closest bear to Antarctica is the spectacled bear, which rambled south along the Andes. It gets no further down than northwest Argentina. (In the Bronx Zoo.) Look at the size of those feet. What with continents drifting apart and all, Antarctica is too far for a bear to swim. Up north, polar bears, who recently spun off from grizzly bears, had a smooth transition across land from warmer climates to icy ones. From there they could stroll onto sea ice. Or swim feasible distances. So even if people weren't making life very difficult for bears (ask the extinct Atlas bear of northern Africa), and they were free to explore new niches, it'd be a long time, if ever, before a bear got far enough south to be selected for Antarctic living. And when we talk about people making life difficult for polar bears, the biggest factor is climate change. Should there be polar bears in Antarctica? No. You've heard that things are getting bad for polar bears. Because of Arctic warming, they're losing sea ice to hunt from. Habitat is melting out from under those huge furry feet. Plate tectonics? What does that have to do with me? You know somebody somewhere is thinking maybe polar bears could be transplanted to Antarctica. Sure, climate chaos is happening there, too, but for now there's still sea ice. Assisted migration! What could be bad? Ask any penguin what could be bad. They will say “Awwwk! I see no problem! Awwwk!” That is because penguins are stupid about land predators. When early explorers brought sled dogs to Antarctica, penguins would walk up to the tethered dogs. “Awwwk! What's your story, furball?” The dogs would tear them to pieces. More penguins would walk up. “Awwwk! Are you new kids?” The dogs would tear them to pieces. More penguins would walk up. “Awwwk! Can I touch your fur?” And so on. In the Svalbard Archipelago, eating a walrus. Gulls stand by ready to help. Polar bears could devastate penguin colonies. In fact, polar bears are already turning to northern bird colonies. They're trying to survive by eating prey so small they previously didn't bother with them. Lots and lots of eggs. So yeah no. Polar bears are an unpredictable bunch. Antarctic wildlife is also subject to the grievous insults of climate change. They don't need rapacious northerners on top of that. Bears? Sure, bring 'em on. There's plenty of room. What ARE bears, anyway? The Monterey county inn offered a special rate. The deal included a “breakfast basket.” Around 8:30 am someone would knock. On the step they would leave a basket with packaged pastries, juice, fruit, yogurt, and hardboiled eggs, which you could draw inside and consume at leisure. They warned that birds might steal from your basket if you left it out too long. True. The first morning I didn't retrieve the basket for several minutes. I came out to find that a crow had seized an egg, and was attacking it with powerful blows of its large black beak. I rescued the egg. The crow had barely started, cracking the shell, exposing the yolk, but eating only a teaspoon's worth. The second morning I lurked. I had angled the shutter slats so I could see without being seen. At the knock, I rushed to peer. Already a crow was striding up the path with long confident steps of its shiny black legs. I think not. I opened the door and the crow wheeled and fled. I enjoyed that. I refrained from shouting a lecture after the crow about how it should be foraging on wild foods. Or asking how it would like it if someone ate its egg. Once I stayed at a place in Mendocino County, in much wilder country, with fancier breakfasts (frittata! cobbler! ), where the competition was so severe that they enclosed the baskets in heavy lidded wooden boxes. That time I didn't have to fight wildlife to eat. If I go again, maybe I'll wait and see who tries for the food, and how. I could leave tools around and see if they select any. Perhaps that's entrapment, legally, but since I have no plans to prosecute, evidence doesn't have to be admissible. No plans at present – if they get the cobbler, that could change.